3 - 5...................Boris von der Weyermühle. 3 - 5,5................Ali von Langenhorst. 4 - 4...................Alfa von der Weyermühle. 4,4 - 5................Akim von Vaciweba. 4,5,5 - 5,5,5........Bingo von Ellendonk. 5,4 - 5,5,5...........Cona von Niederkassel. 4 - 5,5................Brista vom Reuschenberg. Kali vom Blitzkrieger has excellent conformation and substance with full dentition, OFA Good hips and DNA tested as a vWD carrier. 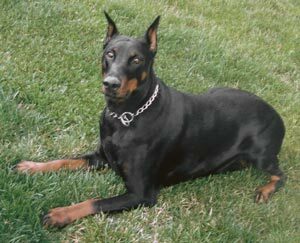 Kali's sire, Erik vom Strundertal, was the winner of the working IDC World Championship in 2000-2001 and lived to 9¾ years of age while her dam, Faroh vom Blitzkrieger, lived to 4½ years of age (passed away prematurely from kidney "filter" damage caused by unknown toxin - it is believed she ingested anti-freeze coolant). Nickolai: SchH 1 (rated pronounced in bitework and HIT tracking).